Anti-angiogenesis therapy is one major approach of cancer therapies nowadays. Unfortunately, anti-angiogenesis therapy targeting VEGF-A was recently stumbled by the drugresistance that results from adaptive mechanisms, such as intratumor hypoxia. To obtain a more efficient therapeutic response, we created and identified a novel chimeric fusion of VEGF121 and VEGF165, which was connected by Fc region of human IgG1 to enhance dimerization. We found that the treatment of VEGF121-VEGF165 chimeric protein reduces proliferation, migration, invasion, and tube formation in endothelial and/or cancer cells through competing VEGF165 homodimer in a paracrine and an autocrine manner. Furthermore, the fusion protein attenuated autocrine VEGFR2-HIF-1α-VEGF165/Lon signaling through PI3KAKT- mTOR pathway in cancer cells. In conclusion, our data demonstrated that the chimeric VEGF121-VEGF165 arrests the tube formation of endothelial cells and interferes with tumor cell growth, migration and invasion, suggesting that it could be a potential drug as an angiogenesis antagonist in cancer therapy. 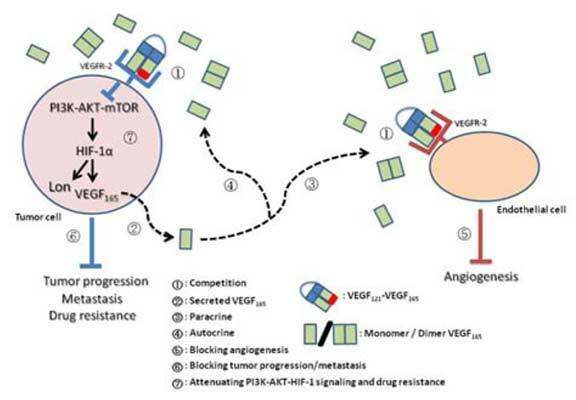 The VEGF121-VEGF165 targets not only paracrine angiogenic cascade of endothelial cells but also autocrine PI3K-AKT-mTOR-mediated VEGFR2-HIF-1α- VEGF165/Lon signaling that drives drug resistance in tumor cells. Our study will open up the patient opportunities to combat drug resistance to antiangiogenic therapy. Keywords: Anti-angiogenesis, drug resistance, hypoxia, lon, the chimeric fusion, VEGF121-VEGF165. Affiliation:National Institute of Cancer Research, National Health Research Institutes, 35 Keyan Rd., Zhunan, Miaoli 35053, Taiwan. Keywords:Anti-angiogenesis, drug resistance, hypoxia, lon, the chimeric fusion, VEGF121-VEGF165. Abstract:Anti-angiogenesis therapy is one major approach of cancer therapies nowadays. Unfortunately, anti-angiogenesis therapy targeting VEGF-A was recently stumbled by the drugresistance that results from adaptive mechanisms, such as intratumor hypoxia. To obtain a more efficient therapeutic response, we created and identified a novel chimeric fusion of VEGF121 and VEGF165, which was connected by Fc region of human IgG1 to enhance dimerization. We found that the treatment of VEGF121-VEGF165 chimeric protein reduces proliferation, migration, invasion, and tube formation in endothelial and/or cancer cells through competing VEGF165 homodimer in a paracrine and an autocrine manner. Furthermore, the fusion protein attenuated autocrine VEGFR2-HIF-1α-VEGF165/Lon signaling through PI3KAKT- mTOR pathway in cancer cells. In conclusion, our data demonstrated that the chimeric VEGF121-VEGF165 arrests the tube formation of endothelial cells and interferes with tumor cell growth, migration and invasion, suggesting that it could be a potential drug as an angiogenesis antagonist in cancer therapy. The VEGF121-VEGF165 targets not only paracrine angiogenic cascade of endothelial cells but also autocrine PI3K-AKT-mTOR-mediated VEGFR2-HIF-1α- VEGF165/Lon signaling that drives drug resistance in tumor cells. Our study will open up the patient opportunities to combat drug resistance to antiangiogenic therapy.